This reissue was probably motivated by the exotica-space age pop revival. The cover, after all, features Angelou draped in a slip of a red dress, gyrating next to a fire in the middle of a (almost definitely fake) jungle. It's really not that strange or cheesy, though. 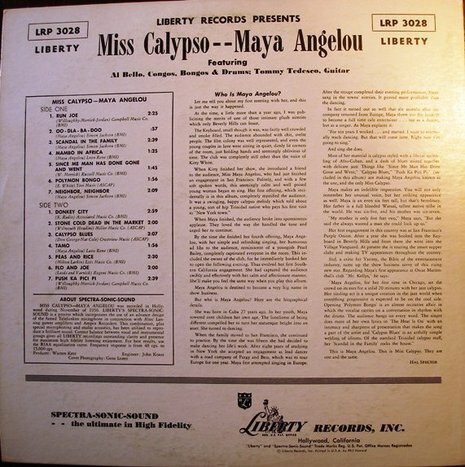 It's more or less straight-ahead pop-calypso, sung with respectable gutsiness by Angelou, who wrote almost half of the material. Somewhat in the mold of the popular calypso recordings from the same era by Harry Belafonte, it features sparse backing from guitarist Tommy Tedesco (one of the most frequently employed L.A. session musicians of the '50s and '60s) and Al Bello (on congos, bongos, and drums). A former drama and dance student at the California Labor School, Maya Angelou worked as a calypso dancer to support herself and her son. She became a member of the applauded Alvin Ailey Dance Company and along with choreographer Alvin Ailey, she formed a dance group called Al and Rita. At the time, she was known as Rita Johnson. 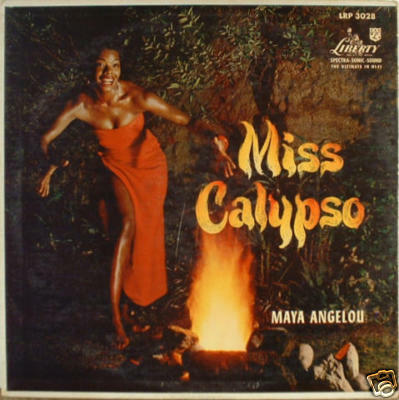 She toured Europe and African in the musical “Porgy and Bess” from 1954 to 1955 and in 1957, was cast in an off-Broadway production of “Calypso Heatwave.” Also that year, she made her feature acting debut in “Calypso Heat Wave” and released her debut album, “Miss Calypso.” Angelou was also spotted singing in New York nightclubs in the late 1950s. In 1954 and 1955, Dr. Angelou toured Europe with a production of the opera Porgy and Bess. She studied modern dance with Martha Graham, danced with Alvin Ailey on television variety shows and, in 1957, recorded her first album, Calypso Lady. In 1958, she moved to New York, where she joined the Harlem Writers Guild, acted in the historic Off-Broadway production of Jean Genet's The Blacks and wrote and performed Cabaret for Freedom. Maya Angelou is known primarily (and deservedly) as a poet, activist and best-selling author, delivering the poem "In the Pulse of the Morning" as part of President Bill Clinton's inauguration ceremonies. She is far less known for her early career as a singer. In 1957, at the age of 27, she made her only sung album to date, Miss Calypso, which consisted of quite respectable calypso songs with pop and world music influences. Very much in line with Harry Belafonte's recordings of this period, and no doubt made with the same lightly subversive civil rights agenda, the album features sparse backing from guitarist Tommy Tedesco ( Top L.A. session musician of the '50s and '60s, best known as a Phil Spector collaborator) and Al Bello (on congos, bongos, and drums), as well as Miss Angelou's surprisingly effective singing voice. 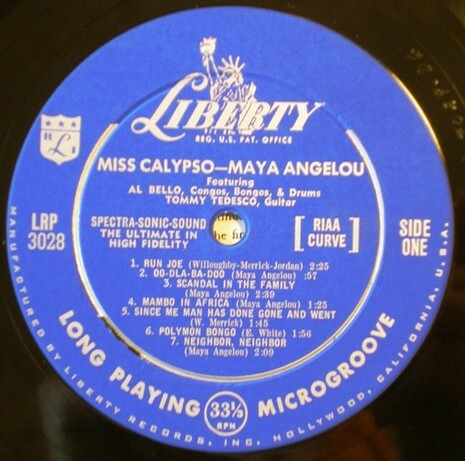 Miss Angelou also wrote half the songs on the album. The kitsch masterpiece of a cover features Miss Angelou draped in a slip of a red dress, gyrating next to a fire in the middle of a fake jungle scene. Altogether an unusual sidelight on the work of a great and important literary figure, and let's not forget, a damn fine record too!